Complete range of analysis results and visualization/export tools. Our software is the only clear choice for simulating high voltage bushing applications involving the modeling of space around the device: that is what we call “large open regions”. Designing high voltage equipment like bushings requires accurate electric field analysis. In practice, this can lead to numerically challenging problems complicated by diverse factors ranging from large open regions to thin layers of contaminates. 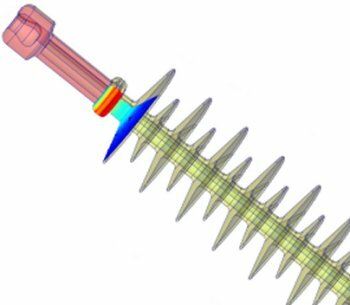 Static (DC), phasor (AC) or completely general transient electric fields can be simulated using ELECTRO (if 2D or Rotationally Symmetric) or COULOMB (where full 3D analysis is required). Both programs can perform electric field simulations using Self-Adaptive Boundary Element Method (BEM) or Finite Element Method (FEM) solvers. BEM is particularly well suited to open region problems (encountered in studies of insulators on transmission towers) and thin layer problems (encountered in studies of insulators contaminated by pollution or water/ice films). In addition to providing outstanding visualization of voltage gradients and field components, both programs also contain advanced analysis features for calculation of streamlines and partial discharge inception in insulating oils. Temperature limitations of insulating materials often dictate the maximum normal operating ratings of power system components. Similarly, maximum allowable temperature rise under fault conditions can determine the required time settings of protective relays and circuit breakers. Steady state or transient thermal analysis can be performed by KELVIN (if 2D or Rotationally Symmetric) or CELSIUS (where full 3D analysis is required). Both programs can be coupled to INTEGRATED’s other field solvers to include heat sources produced by ohmic and dielectric heating, as well as core loss curve calculations.